Master Class is a quality brand of deluxe products. 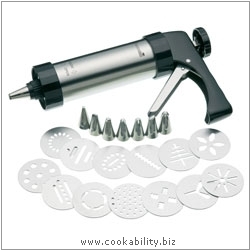 Stainless steel barrel with eight nozzles for icing and 13 templates for making a variety of different shaped biscuits. Supplied in a durable storage box.